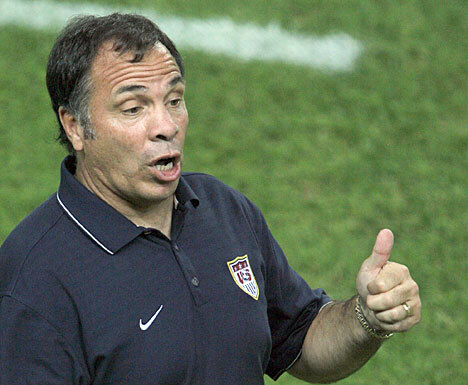 Yesterday it was made official with Bruce Arena being named the Head Coach and GM of the LA Galaxy. Also of note is that Brighton native Dave Sarachan was named Associate Head Coach. It will be interesting to see how Bruce's run with the Galaxy goes after a less than stellar stint running the show with the NY Red Bulls. The biggest hurdle in LA will likely be balancing the star power of David Beckham and Landon Donovan and their impact against the Galaxy's salary cap. The Galaxy are already rumored to be shopping Carlos Ruiz to make cap room for veteran defender Eddie Lewis. And it will be interesting to see what other moves Arena has up his sleeve to improve the Galaxy that are currently a mess defensively. When the USMNT takes on Guatemala tomorrow evening, they will be looking to keep their record of never having lost to Guatemala during World Cup Qualifying intact. The US is 4-0-4 in World Cup Qualifying against Guatemala with all four of the wins coming on US soil. The last World Cup qualifier between the two countries was a scoreless draw in Guatemala City on September 7,2005. The next match for the US will be in Cuba on September 6th with the first home match of this round coming on September 10th versus Trinidad & Tobago at Toyota Park in suburban Chicago. - According to Yanks Abroad, a work permit is the only hurdle left in Maurice Edu's move to Rangers. - Grant Wahl has a nice article on Angela Hucles at SI.com and Dan Steinberg takes a look at Heather Mitts' iPod ahead of Thursday's final versus Brazil. - Greg Lalas has a nice interview with the newest member of the Colorado Rapids, Cory Gibbs on Goal.com. - Speaking of MLS newcomers, Steve Davis has a nice article on MLSNet.com about all the players that made their debuts with new teams over the weekend, including Brian McBride in Chicago and Pat Noonan in Columbus. - Atlanta's Macoumba Kandji isn't the Red Bulls only forward target per the NY Post. Brian Lewis says that the Red Bulls are also targetting two MLS forwards as well. It will be interesting to see how this all plays out. - Speedy US U-20 forward Johann Smith has signed with Toronto FC according to The Star.com. Smith played at PAETEC Park last year when the US took on Argentina ahead of the U-20 World Cup in Canada. - The CFL's Toronto Argonauts have angered Toronto FC fans by saying that they are looking into moving their home games to BMO Field. I wonder if they would get an upgraded palying surface out of the deal?